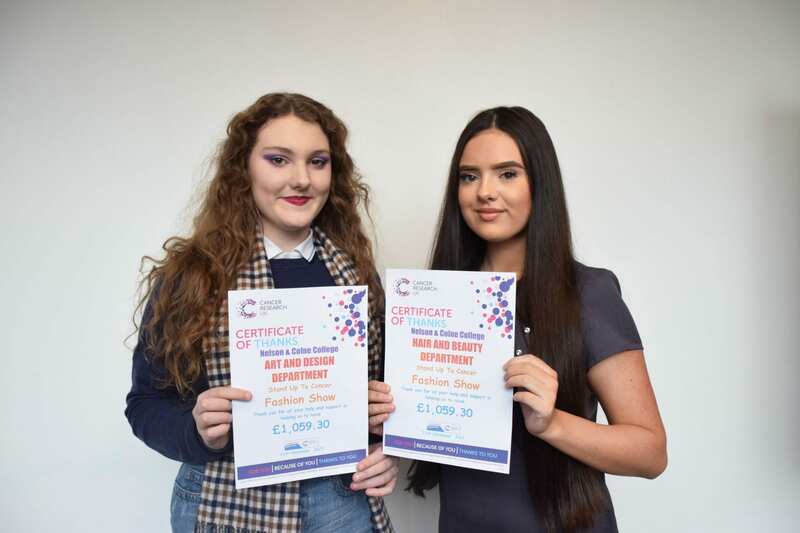 More than 40 Nelson and Colne College students took part in a charity fashion show raising over £1,000 for Cancer Research UK. Organised by the Pendle Hill Fundraisers for Cancer Research UK, the Stand Up to Cancer Fashion Show at The ACE Centre in Nelson was attended by around 100 people and raised a total of £1,059.30. Alongside fashion displays from M&Co. in Clitheroe and Blue Ginger in Keighley, NCC A Level and vocational students in the Creative and Media department showed off and modelled some of their own clothing and jewellery designs and filmed and photographed the event. The College’s Hair and Beauty students were also integral to the show, working away backstage on hair and make-up as well as taking it in turn to model on the catwalk. Vocational Art and Design student Cerys Wrigglesworth, 17, said: “I found it a really good experience as I was creating individual pieces for a fashion show featuring designer clothing from established retailers. Maggie Cannon, Secretary of the Pendle Hill Fundraisers for Cancer Research UK, said: “It was a fantastic evening and we raised a really good total for the charity. Sarah Holmes, Nelson and Colne College Curriculum Leader for Art and Design said: “The fashion show was a brilliant opportunity for our students to showcase their creative fashion and textile skills in a professional setting. Alongside creating their fabulous garments, they have also learned such a lot about working in an environment like this under pressure. The next NCC Year 11 Open Event will be on Monday 5 February from 5.30pm until 7.30pm and there will be a Year 9 and 10 Open Event on Monday 30 April between 5.30pm and 7.30pm.